In 2010, Resene was awarded the Marketplace award, a special commendation for being a finalist in all categories (the only company to achieve that) and the overall Exemplar award - large business. In 2010, Resene won the Sustainable Business of the Year Award and the Trailblazer - Large & Corporate Business Award at the National Sustainable Network Awards and at the Sustainable Business Network Central Awards. In the AGM Specifier Choice Awards, Resene was voted Best Interior Paint, Best Exterior Paint and given the Supreme Award across all categories. Readers of Architecture NZ magazine voted Resene best interior paint in 2001, 2002, 2004 and 2005; and best exterior paint in 2001, 2002, 2003, 2004 and 2005. The reader awards have not run since 2005. 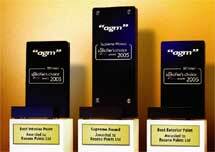 Resene was awarded a Green Gold award for sustainability in the Wellington Gold Awards 2009. Resene won a Gold Award in the Wellington Business Awards in 2004, celebrating the positive impact Resene has had on the manufacturing and industrial sector. 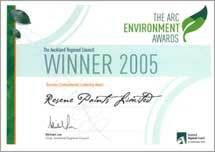 The Resene PaintWise programme has been recognised as a breakthrough in environment focused programs receiving the Business Environmental Leadership Award in the ARC Environmental Awards 2005 and an Award for Excellence in the Environmental Packaging Awards 2005. In 2006, Resene won a Rodney WasteWise award, was finalist in the Wellington Sustainable Business Network Awards and was Highly Commended in the Waikato Sustainable Business Awards. Resene won a Rodney District WasteWise Award in 2006. Resene was also named a finalist in the SBN Central Get Sustainable Challenge awards and was highly commended in the SBN Waikato Get Sustainable Challenge awards in 2006. Resene was awarded a Green Ribbon award in 2010 by the Ministry for the Environment. Resene ColorShops have regularly been named as finalists in the Top Shop awards, with some going on to win their category, including New Plymouth Resene ColorShop in 2004, Marion Street in 2005 and Johnsonville in 2006. The Resene website has won many HitWise awards based on the number of visits. Twice a TVNZ Marketing Awards finalist, the Resene EzyPaint virtual painting software was the first downloadable virtual painting software available free to decorators and specifiers. Winner of the Industrial Research Ltd’s (IRL) What’s Your Problem New Zealand? competition 2009. Winner Most Trusted Paint brand 2012. Winner Most Trusted Paint brand 2013. Winner Most Trusted Paint brand 2014. Winner Most Trusted Paint brand 2015. Winner Most Trusted Paint brand 2016. Winner Most Trusted Paint brand 2017. Winner Most Trusted Paint brand 2018. 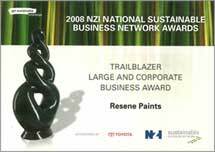 Resene was awarded an Auckland City Community Safety Award - Commerce in 2010. To celebrate 30 years in business in the New Zealand market, Trends launched Trends Top 30 New Zealand Homes. Congratulations to Resene Paints as a supplier to fourteen of the selected projects. View Resene's award certificate. The Trends Top 30 New Zealand New Homes are appraised by a Trends panel on the basis of excellence in design, function, product specification and style. To celebrate 30 years in business in the New Zealand market, Trends launched Trends Top 30 New Zealand Kitchens. Congratulations to Resene Paints as a supplier to six of the selected projects. View Resene's award certificate. The Trends Top 30 New Zealand Kitchens are appraised by a Trends panel on the basis of excellence in design, function, product specification and style. Gold Medal Winner 2015 for Promotional Print - Resene Non-Skid Deck & Path chart.